Mirror, mirror on the wall, what’s the most important body part of ‘em all? So often, we allow the mirror to answer this question and dictate our training emphasis—chest, biceps, abs. It’s the “beach workout” and the reason most of us go to the gym—to look good naked. But there are two fundamental problems with this. First of all, posture slowly goes to hell in a hand-basket. Overdeveloped mirror-muscles will internally rotate and slouch the shoulders and upper back and you’ll end up looking like a depressed gorilla. Second, the mirror muscles will eventually stop growing. Your two primary external rotators are your Infraspinatus and your Teres Minor. These are relatively small muscles that sit on top of your scapula (shoulder blade) and attach to the outside of the humerus (upper arm). When your arm is at your side and you externally rotate, the Infraspinatus does most of the work. When your arm is lifted 90 degrees at your side and you externally rotate, the Teres Minor does most of the work. Both of these muscles are extremely important for shoulder strength and stability as well as continued development of your strong internal rotators—the good ol’ pecs. If your bench press has hit a plateau, try adding single arm seated external rotations to your routine. Keep your tempo slow and add a pause in the bottom position to make sure you’re properly engaging your external rotators and not throwing the weight up with extraneous movement. Many of us are upper trap dominant. Check your shoulders right now. I bet they’re elevated. When we sit, when we read, when we’re cold and when we watch M. Night Shyamalan movies our shoulders have a tendency to elevate. It’s a natural protective mechanism. But in order to maintain good posture and at least appear to the world to have some semblance of confidence, we want our chest forward and our shoulders down and back. 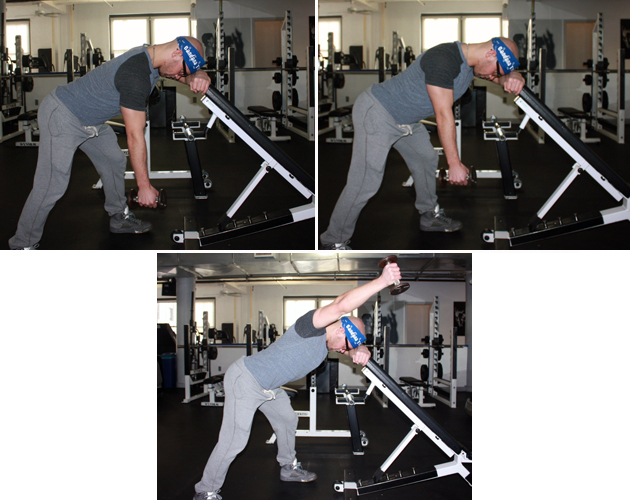 The lower portion of the trap, sometimes referred to as the Trap 3, needs to be strengthened in order to do this. Add bent-over Trap 3 work to your routine to help maintain proper alignment. While leaning over an incline bench, relax your arm to your side, slowly shrug your shoulders up and continue the movement by raising the dumbbell overhead. As with the external rotation, I find that these superset well with an upper–body push exercise or a lower-body exercise. To retain/regain a proper range of motion in your upper back and neck, address your thoracic mobility by foam-rolling your upper back before your workouts. 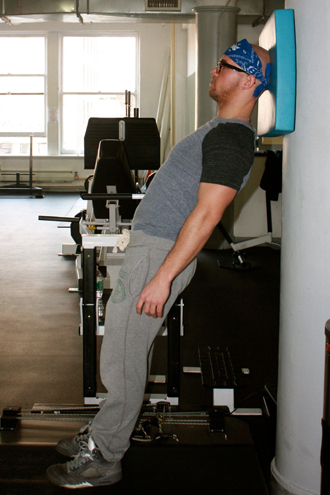 At the end of your workout, add some standing isometric neck work against a wall to maintain your neck strength. Make sure you have perfect alignment by keeping your chin tucked and pressing the back of your head against the wall (not the top of your head). Use a mat or pillow if the wall hurts. Do 3 minutes of total work, divided into as many sets as needed. As you continue to strengthen your neck, you can walk father away from the wall. Eventually you’ll need to move to a physioball, but be sure to progress gradually. We all want to look good in the mirror, no doubt. But you can’t build a temple on a shaky foundation. If you want your pretty-boy muscles to continue to grow and you want to display them on a frame that is aligned and well-postured, be sure to work on your external rotators, lower trap and neck.